I’ve been a subscriber of Tropical Fish Hobbyist magazine on and off for quite some time now. I would buy a magazine from the local bookstores from time to time, and a subscription eventually took over. I would often thumb through the articles, reading those that were related to saltwater and usually skipping the freshwater stuff. But over the last several months, I’ve found myself to be spending less time on the magazine. I just assumed there wasn’t many magazine-worthy saltwater topics to write about, but the decreasing number of saltwater articles is really getting me to rethink my subscription. In the latest issue of TFH, the February 2011 issue, there are approximately 23 articles of varying lengths. Of these articles, 17 are freshwater! They cover planted tanks, freshwater Q&A, multiple cichlid topics, and stuff on discus. 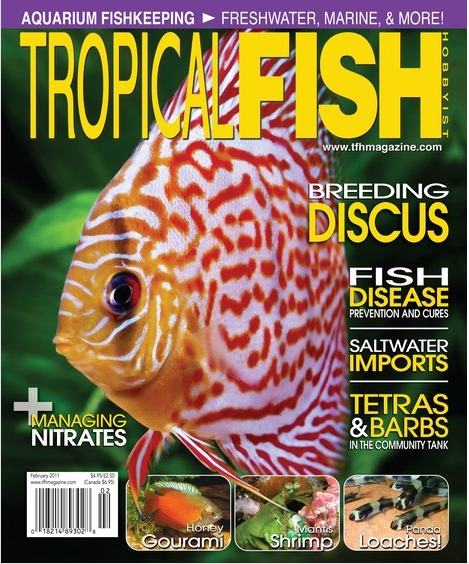 One of the articles in the mag were even about triops…yes, triops. I’m not sure why the saltwater portion of the hobby isn’t being covered to the same extent as freshwater, but I would certainly welcome a change. TFH has been a great magazine for years, and I’m not saying that it is declining, but my interest in the topics certainly is. Freshwater tanks simply do not fascinate me to the extent marine tanks do. Hopefully the next few issues will start including more saltwater topics. I don't think it's in their best interest to cover more FW than SW. As a keeper of both tanks for nearly 20 years I've noticed marked differences in the community around each hobby. SW owners naturally form groups to trade and discuss and show off, while the majority of FW keepers are completely autonomous. Just look at the online forums. There are a few active FW ones, more recently due to the interest in high quality planted tanks. But, there are multiple SW forums, local forums, with many active members in just about every city in the US as well as national and international forums. Additionally, SW keepers spend multiples more to get setup and multiples more to maintain their tanks. Based on this alone it seems like a poor decision not to make SW the primary topic of the magazine. agreed, that's why i'm so frustrated with the magazine.